Barbara Finn May, formerly of Arlington Heights was born on April 11, 1930, in Chicago Heights, Illinois to Bernard and Helen (nee Coughlan) Sullivan. 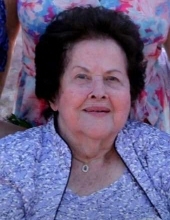 She died Friday, January 25, 2019, peacefully at her home surrounded by her family. Barbara is survived by her children James (Sue) Finn IV, Mary (Jim) Petermann, Maureen Finn, Bob (Kathy) Finn, Joanne Carroll, John Finn, and Michael Finn; her stepdaughter Maryann (Steve) Radowski; her grandchildren, Jim Finn V, Joe Finn, David Collins, Julie Johnson, Brendon Meltz, Sarah Young, Steffanie Magallon, Colleen Barrett, Caitlin Carroll, Michael Carroll, Natalie Finn, Michael Finn; step-grandchildren, David Radowski, Jeanna Radowski, Stephanie Galkowski, Rebecca Galkowski; her great-grandchildren, Jackson Finn, Ava Finn, Patrick Finn, Shaelyn Dieter, Kyle Johnson, Ayana Collins, Sofie Young, Colton Young, Ryan Magallon, Mica Finn, Breann Haegeman; her great-great-granddaughter Lileigh; her sisters-in-law, Lois Sullivan, and Barbara Finn; and her many devoted nieces and nephews . She was preceded in death by her husbands Jim Finn, and Jim May; her parents; and her six siblings. Visitation from 9:30 am until time of funeral Mass at 11:00 am, Thursday, January 31, 2019, at Holy Family Catholic Church, 2515 W. Palatine Rd., Inverness, Illinois. Interment St. Michael Cemetery, Palatine, Illinois. "Email Address" would like to share the life celebration of Barbara Ann Finn May. Click on the "link" to go to share a favorite memory or leave a condolence message for the family.